Free Shipping Included! Tear Drop Spade CZ Dangling Earrings in 14K Yellow Gold by Jewel Connection at Blood of The Young. MPN: OS911430. Hurry! Limited time offer. Offer valid only while supplies last. Our Best Quality Tear Drop Spade CZ Dangling Earrings Sophisticated and elegant, these earrings are the perfect size and color for everyday wear. ★SPECIAL PACKAGING: These Tear Drop Spade CZ Dangling earrings come in a Gift Box, so whether for you or a friend, the earrings arrive in a package appropriate to their style. 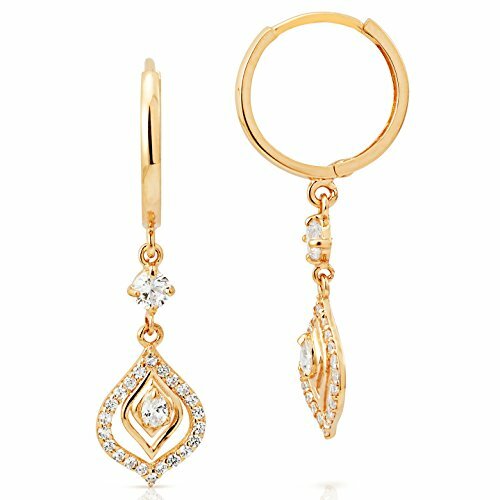 #9733NOT JUST GOLD: While the solid 14k yellow gold is impressive on its own, the cubic zirconia will dazzle all making these earrings perfectly suited for day or evening wear. ★THERE IS NO WAIT: Delivered FAST, these Tear Drop Spade CZ Dangling Earrings get to you quickly so you can start wearing them when and where you want.